Elbert also contributed to the development of Georgia’s school system as well as serving a term as Governor. Please note: The locket image above was shared by Richard Elbert Whitehead, a direct decedent of today’s subject. We owe him many thanks for his kindness. While writing for Founder of the Day, I’ve noticed that many of Georgia’s Founders are transplants. There is a split between Founders who relocated from other colonies or immigrated from other nations. This is not the case for Samuel Elbert. Elbert was born in Savannah and raised in the modest household of a Baptist Minister. By 14 he was orphaned and began working for John Rae, a wealthy resident of the city. While working for Rae, Samuel began trekking out to the frontier to negotiate treaties with the Native Americans. He was liked and treated will by the Nations he met with, which may have saved his life in the years to come. When hostilities arose with the Mother Country, Samuel Elbert became one of the first Georgians to speak out. He was quickly appointed to the colony’s Committee of Safety and joined the Militia. Elbert was instructed to sail with 400 men under his command to Florida. His goal was to meet with John Baker (who traveled by land) and attempt to cede Florida from British control. Unfortunately, heavy winds and low tide delayed Elbert’s ability to travel and by the time he arrived Baker’s men had already been driven away. Facing a superior force, Samuel abandoned the mission. Elbert was also involved in a second invasion of Florida, however, a power struggle between Georgia’s Governor and the Major Generals ended with that colony being abandoned once again. From this point Georgia took up a defensive position against their neighbor to the south. Samuel was one of the last to evacuate Savannah when it was occupied by the British. He continued as one of the highest-ranking Militia leaders in Georgia after the rebels had mostly fled the State. It was at this time that he joined General John Ashe in an attack on the enemy. In what became known as the Battle of Brier Creek, Elbert rallied his men when all hope seemed to be lost and fought valiantly. He only surrendered after his life was spared by a British Officer. Samuel was taken captive and spent over a year as a POW. During his time as a prisoner, Elbert was given unusual freedoms. This seems to have been done so the British could put a hit out on him. Legend has it that while walking in the woods, Samuel was stopped by two Native Americans who held him at gunpoint. The suspicion is that they were hired by the Redcoats to kill him. However, thanks to his friendly relationship with the Natives, Elbert was able to flash a secret hand signal (I know, I called it a password in the title to draw you in, I apologize). His assailants recognized the signal, spared his life, and set him free. After his release, Samuel Elbert was called to speak with George Washington who admired the young man and placed him in charge of an entire brigade at the Battle of Yorktown. When the Revolutionary War concluded, Elbert became one of the most respected men in his State. He was a Sheriff and worked to create the first Sunday School in the United States. He was also elected to the Congress of the Confederation but turned it down due to poor health. Eventually, Samuel was offered, and humbly accepted, the office of Governor of Georgia. During his one term in the State’s Executive Office, Elbert worked with Abraham Baldwin to create the first State chartered institute of higher learning in America, what we now know as the University of Georgia. 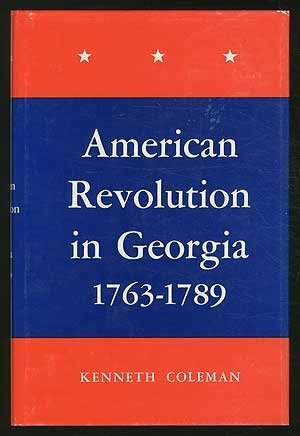 Do you want to read more about the American Revolution in Georgia? Try these articles on Declaration Signers Lyman Hall and Button Gwinnett. I also wrote a lot about the disaster at Brier Creek in my article about John Ashe. Want to read a great book about the Revolution in Georgia? ‘The American Revolution in Georgia’ is the definitive authority on the subject. Pick up a copy through the Amazon affiliate link below (you’ll support this site, but don’t worry, Amazon pays me while your price stays the same).